So, this new edition of a classic Nektar album is awesome. The whole epic has been covered by me at MSJ before. Actually the first three bonus tracks have also been covered by me. So, for the sake of consistency this will be drawn from the previous reviews. The additional material will be fresh to this review. It should be noted that this packaging and CD are the best of the bunch to have been released so far. This is great. It should also be noted that the cover lists the radio edits of “Let It Grow” and “Lonely Roads” in the wrong sequence. I’ve got them in the right order in this review. 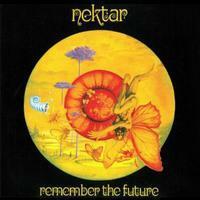 There are those who consider Remember The Future to be the creative peak of Nektar's career. Certainly there are reasons to buy into that philosophy. The album is an ambitious effort, one extended work divided into two parts. The music is very seamless, seeming much more like one long composition than a series of shorter songs tied together. Few bands could pull off something of this nature, and even less could do with it as much style as Nektar did. For these reasons, and just the sheer entertainment value, this album is recommended as a must have both for fans of the band and for prog fans in general. Rising up out of nothingness, a crescendo of sound begins the piece. A somewhat funky guitar chording starts the song proper and the other instruments gradually join in. This syncopated segment features great work from all. It gives way to a more dramatic and balladic guitar styling. The band builds on this format, running it through its course as an instrumental segment. As the next vocal section enters the song takes another curve moving into new, slower dramatic directions. They continue to build on this mode for a time until a new faster-paced segment enters. This carries into the dramatic "Who made you, Who made me" section that gets quite dramatic. This itself is full of drama and change. The latter portions of the cut are especially triumphant right until the resolution of the story line so far. There it shifts to a slower, more melodic style. A droning segment enters to allow for an instrumental break that thoroughly rocks out in prog power and energy before the whole piece circles down to make way for part two. Coming in with a sedate guitar melody, the other instruments join, and a melodic rather pretty progression begins to rise up and take the piece. This mode maintains until a more dramatic section takes its place. This dramatic instrumental mode plays through then another new movement begins in a balladic type of style. The cut builds on that mode, and we come into another powerful verse. After this segment plays out for a time another new melody line emerges and begins a building process for a time. As part of this building a chanting type vocal enters, then as this crescendos a new section appears powered by a somewhat funky bass line. It continues on in this way for a time recreating and restating this theme. Then a triumphant chorus enters and crescendos giving way to a slightly melancholy melody. An extremely brief faster-paced segment intercedes. When the melancholy section returns it is not again interrupted. The verses based on this mode are very dramatic and evocative and truly this is probably the most powerful section of the whole album. It moves on from there to another slow paced movement that somewhat carries on the texture of the one that gave way to it while felling just a little Floydish, particularly in the guitar tones on the solo. The cut stops for a moment, then a new chording pattern with a fairly quick tempo comes out, and earlier vocal themes return. The cut builds on this until another triumphant and powerful chorus takes it. The composition continues to alternate between these two modes before a segment driven by funk-oriented guitar and potent vocals moves us into new territory. The next movement gets extremely funky, but really jams. The movement that brings us out of there is harder edged and just a bit in the mode of Captain Beyond. The funk returns once again along with more Gilmourish guitar soloing. That segment ends abruptly and atmospherics take the album to its conclusion. This is a ten-minute revision of the epic. A single version of this classic segment, this balladic texture works well. Another snippet from the epic used for promotion, this features a solid rocking prog section that feels a bit like Captain Beyond. Starting rather tentatively, this is very psychedelic in a lot of ways. There’s almost a Badfinger kind of vibe to the chorus. There is really an early 1970s sounding number that’s pretty cool. There are definitely some hints of the Beatles, too. There is almost a Traffic feeling to a lot of this, combined with a classic psychedelic sound and something that’s trademark Nektar. It’s another good tune and has some tasty guitar soloing on it. This song is rather deceptive. A balladic motif, quite mellow and quite pretty opens it and carries the verses. It’s slow and contemplative. That’s counterpointed with a crunchy, fast paced jam that really rocks. There are some great retro keyboards later. Starting quite tentatively this grows up with a real psychedelic sound. There is really a 1960s exuberance to this. Sounds of the Beatles merge with more typical Nektar elements. At times it feels like there are hints of The Grateful Dead, too. There’s almost a Southern rock vibe to the opening jam of this cool tune. It turns out to a fast paced jam with a lot of psychedelic rock and classic prog in the mix. There’s also a mellow psychedelic jam mid track with some intriguing vocal harmonies. A mellower, slower moving cut, the psychedelic elements are definitely all over this one. It stays pretty constant for quite a while. Then the vocals bring an intensification and a guitar solo follows. It’s cool to hear Nektar covering this classic tune. It’s got The Beatles in it, alongside the more typical Nektar sounds and perhaps even some Vanilla Fudge. The hard rocking jam later is great. There’s almost an Allman Brothers vibe to it. A mellow, slow moving ballad, this is pretty and evocative. It rocks out further down the musical road.